Whatever the cause, by noon my mind was spinning in a thousand different directions at once. I guess it was that "monkey mind" http://pixiedusthealing.blogspot.ca/2011/05/monkey-mind-animal-signs.html kind of chatter that is so intense it can quickly become overwhelming. I was already focusing (and I use that term loosely!) on about six different and significant projects and really couldn't harness myself to pick something and stick to it, yet I couldn't get my mind to settle on one. People were coming at me from multiple directions too. No one was demanding. They were all great things and good conversation, lots of it was positive or "big shifting" at least, but just intense I guess. So, while all this rattled around in my head to the point of explosion, I decided I really needed to focus on just getting the frozen groceries home in 34 degree Celsius weather. Sometimes it is the most obvious issue that first needs attention!!! So I was finally concentrating on a task and very focused on taking the most direct and fastest route home, particularly because, putting on the air conditioning in my car makes the engine light go on and I was positive my brain could not receive any more stimulus of that nature! That's when I had to come to a somewhat screeching halt to allow a mother duck and her babies to cross the highway! 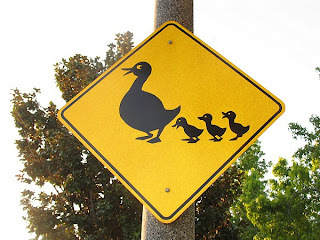 Now, we do have these "warning duck crossing" signs in my part of the world like todays' picture. I realize they may seem pretty unusual if you live in a "non-protective duck zone", but they are common around here. They aren't erected on major highways though. There was no sign in place anywhere near this particular spot. Perhaps it was because she knew she really wasn't in a cross walk, that the mother duck was honking the entire time she crossed. She had way more babies behind her than the three in the picture- I'd say close to ten. They were totally in line, completely bunched up into a tight single file formation and no one was straggling. This was serious business. They weren't looking around enjoying the scenery. They weren't thumbing their wings at the cars that had to stop "because Mom said so". They were totally 100 percent focused on Mom. She was large and in charge. She didn't seem anxious. She just seemed in control; fully capable of honking herself and her children across the highway ensuring all danger stopped to allow her success. It worked. They all got across in rapid time and as soon as the last one was off the pavement, the honking stopped.
" the time of turmoil has passed, so now you can release any pent-up emotions that have been suppressed... Do whatever is necessary to find emotional comfort rather than trying to deny your need for this"
My wondering mind got thinking about that Mother Duck. It was her presence that really stood out in the duck experience to me. It wasn't about a gaggle of ducks. It was about a Mother Duck leading her children to safety and a new experience. I was recently at a high -level, professional, conference. We were in a room packed to capacity and then some. The chairs were arranged in a circle. The topic was about leadership. In particular, it was about women in positions of leadership and the role of feminine energy in a shifting world. The facilitator started the session with ,what to me, was a powerful but unusual exercise. We went around the circle, said our first name followed by the full maiden name of our mothers'. It was powerful. The experience has stayed with me. Some people stumbled over maiden versus married last names. Some people said, "my mothers name is", others said "my mothers name was" and there was power in that alone. Some people cried. Some people laughed. Everyone seemed reflective. By the time we got to the end of the circle it felt like the energy in the room had doubled. There was a lot of spirit there for the rest of the session. So on the way home with my "not -so- very frozen food", I made a vow to myself to say my mothers name out loud, every day. I did it in the car and realized by doing that I had actually settled my monkey mind. It was almost like a cool cloth on a feverish brow; that type of "mother thing". "call on Duck energy when you realize you have been taking yourself way too seriously and you need to lighten up. " So.. I put the groceries away, but I didn't respond to the emails and notifications. I didn't follow-up on the meeting tasks. I didn't put an action plan in place to sort through all the things I needed to do all at once. I went for a swim. I needed that. I soaked my head and soothed my brain and heard my mother clapping from the lifeguard chair. Here's too Mother Duck energy in this world and beyond!